One of the easiest ways to bike out of the city limits of Milan is on a canal path, and if you head east on the Martesana Canal, as I did one morning in late June, turn left after 25km at Gorgonzola and continue for another 5km on a quiet country road you arrive at a factory with a distinctive ace of clubs logo above the entrance. 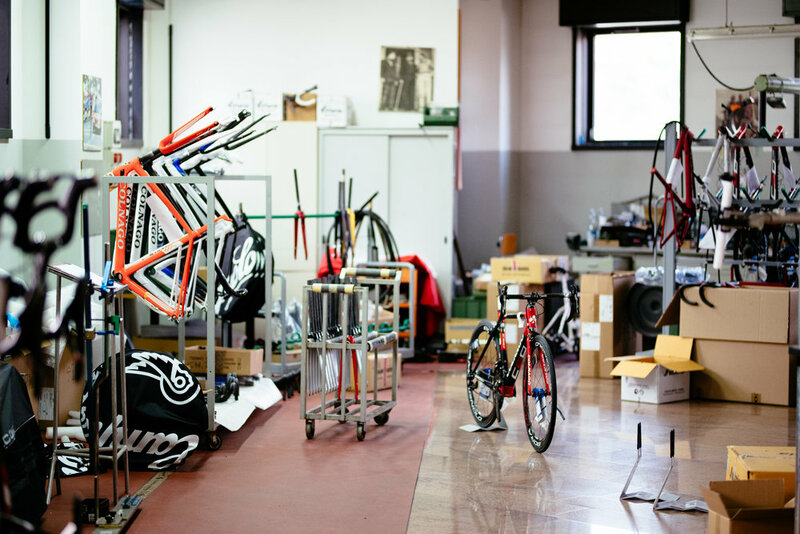 For enthusiasts of Colnago this is the dream factory, and a special place for anyone who loves cycling’s rich culture. Directly opposite, on the other side of the road, with its ace-of-clubs wrought-iron gates, is the house where Ernesto Colnago began making bicycles 63 years ago - bicycles which have since been ridden to victory in 61 world titles, 18 world cups, 21 grand tours and 11 Olympic gold medals. I was there for the launch of Colnago’s newest release, the V2-r, an updated version of its high-end, all-purpose V1-r frame from 2014 and I was early, which was perfect because it gave me time to ogle a roomful of Colnago’s creations in an upstairs museum. Oscar Freire’s C50 from one of his three world championships was there, as well as a brace of C40s from the 1999 Paris Roubaix, still with dirt from the cobbled roads and a distance guide on the stem of Andrea Tafi’s race-winner. When the launch began a small, gnome-like man stepped quietly into the presentation room and sat down alongside the journalists. 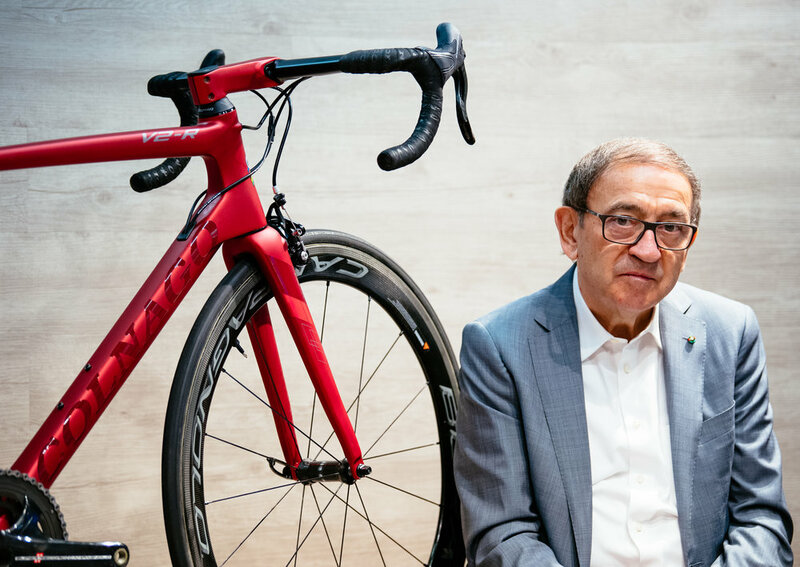 It was Ernesto Colnago, cycling’s most iconic manufacturer, and at 86 still at the helm of his business – although 30-year-old Davide Fumagalli is now the key decision-maker as Head of Technology. So it was Fumagalli who took us through the details. Colnago has three high-end frames; the C60, the Concept and now the V2-r, which Fumagalli described as a race bike designed to perform in all conditions and terrains – climbing, sprinting and rolling distances. The V1-r was well received at the time, although there were a few niggles that have been addressed in the update. The most important of these is taking the rear brake from its mount under the bottom bracket, where it was fiddly to fix, difficult to clean and messed with power meters, and direct-mounting it in the traditional position on the seat stays. It had been placed under the bottom bracket to help shave off weight and Fumagalli said the challenge had then been to keep the frame weight at the 835 grams of its predecessor. Unlike the C60, which is lugged, the V2-r is a monocoque frame, created in single manufacture. The wall of the new frame is 35 grams lighter, with 7 percent increased stiffness overall, according to Fumagalli, along with an increase of 13% lateral rigidity in the bottom bracket. “This is a frame which responds brilliantly to acceleration,” he said. The most eye-catching feature of the model we were looking at – apart from the gorgeous, limited-edition, anodised red paint job – is the integrated seat post, which adds a really slick look to the frame. A close look at the blunt rear end of the seat post highlights the overall tube structure, technically known as Kammtail - a teardrop shape with the tail cut off, which is supposed to increase the frame’s aerodynamics. More practically, however, a combination of the double-bolt direct mount of fore and aft brakes, and wider clearance in fork and chain stays allows for tyres of up to 28mm, and even 30mm in reality. Cable routing on the V2-r is internal, through the top of the top tube, which adds to the very clean lines. Along with the anodised red model, the Colnago team also showed separate black and white models, and a disc-brake version of the bike. Frame prices will be comparable to the V1-r, between US$5,500 and US$6000. The company also announced an update to the C60, which will come with longer chainstays, direct-mounted brakes and increased clearance for fatter tyres. And both the C60 and the V2-r disc-brake versions have HexLock through-axles. A day after the launch, we were back at the factory for a test ride. Colnago had rounded up a handful of celebrities to join us, included two-time Giro winner Paulo Savoldelli, Simone Consonni and Simone Petilli from the UAE team, and Massimo de Luca, the Phil Liggett of Italian TV. Our 60km ride took us from the factory into the hills behind Monza, where most Milanese cyclists go to train. The bikes were fitted with Campagnola Bora wheelsets and Super-Record groupsets. At first, probably because it was so different to the bike I had just ridden out on, the V2-r felt a bit sketchy around the headset and steering. Halfway through the ride, though, the sensation had dissipated and it just felt, well, damn stiff. Not so stiff that I felt every crack in the road, but certainly it was responsive. Mostly, I liked the beautiful, sure tracking in the descent as we soared around the Brianza hills. It felt measurably more comfortable than the Colnago President I had been riding. It’s hard to go into more detail on such a short ride; but there’s no doubt this is a high-performance bicycle. UAE Tour contender Louis Meintjes was the first to have a crack on it in July. For everyone else, frames have been available from mid-July. Appeared first in Volume 1 of the print edition of New Zealand Cycling Journal.Subscribe to our print edition for the best of New Zealand Cycling. NZ Cycling Journal reviews Wahoo’s Elemnt Bolt. Meet Cannondale’s do-anything Slate with SRAM Force CX1.